If fishing is not your thing, the area is alive with Celtic music with something going on nearly every night all summer long. We are located between 30 and 90 minutes of four golf courses and make a great headquarters for playing the Cape Breton four course package. All the courses are of high quality with the Highland course rated #1 in Canada in 2005. Don’t pass up the opportunity to have a very special golf vacation. The Salmon Pool Inn is also superbly located for trips around Cape Breton, particularly the Cabot Trail. Many of our guests are couples traveling together who make the inn their base for a few days of sightseeing without the fuss and bother of changing accommodations every day. Day trips can be relaxed, no rushing or schedules to maintain. You can stay all day, have a nice dinner out, knowing your room is waiting for you. Beaches are numerous and on our side of the Island (west side). they have warm water — that’s right, warm water beaches in Cape Breton thanks to the meanderings of the Gulf Stream. There is also deep sea fishing and whale watching available with locations 10 to 50 minutes away. Guaranteed whale sightings by some operators. Hiking trails are numerous, some inside the Highlands National Park, where in addition to spectacular views, moose and other wildlife make regular appearances. Sit on our large veranda and take advantage of magnificent river views, or watch the eagles that perch in our trees. Your relaxation is our paramount consideration. At night, relax and talk in front of the fireplace, or enjoy our satellite TV in the lounge. Sleep peacefully in our comfortable rooms. Many rooms at the Salmon Pool Inn feature ensuite baths. The Salmon Pool Inn makes a perfect retreat for meetings for up to 10 people. Meeting facilities and internet services are available. Chef available for dinners when pub is not open. The Salmon Pool Inn offers the perfect location for golfers as well. Cape Breton Island offers some of the finest golf in all of Canada. With both Cabot Links and Cabot Cliffs 15 minutes from our lodge, the Salmon Pool Inn is your perfect accommodation for your Cape Breton golf vacation! 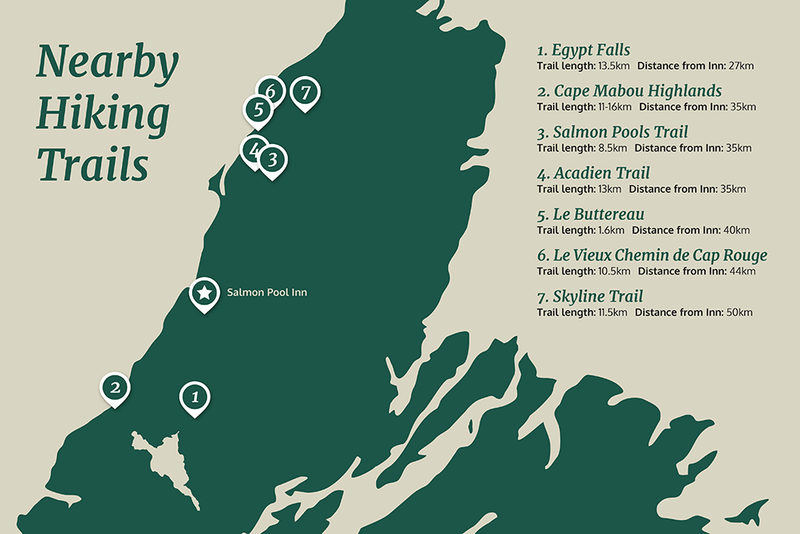 The Salmon Pool is an ideal starting point for you to explore and experience some of the most beautiful nature trails Cape Breton Island has to offer. Transportation is available, please contact us for more information. Visit our Cape Breton Golf page for more details.